A very turbulent childhood has resulted in the development in my adult years of a mental illness described as complex post-traumatic stress disorder. At times it can be challenging to face the psychological injuries from my past and it was during one of these times when I became so mentally and physically unwell that I required a hospital admission. It was during my stay in hospital that I met nurse Caroline. Her infectious enthusiasm for Recovery Camp encouraged me to apply and I attended Camp in May 2015. I needed to muster some courage to attend but it was made so much easier as we were to all travel together so I had a opportunity to met others going to camp at the station before the later pick up of most of the staff and students. This did relieve some of my apprehension and in this informal environment I started to feel at ease and to look forward to the week ahead. Upon arrival at Camp we were shown to our shared accommodation and then divided into groups identified only by colour. I was in the red group. When living with a mental illness it is easy to loose that sense of fun in living. This is what I regained at Recovery Camp. Everyday was a new adventure which started with a lesson in Tai Chi. We were very fortunate to have such a dedicated instructor. All the meals were taken together where we had the opportunity to share with the students what life looks like living with a mental illness. During the week it was empowering for me to be identified only by my name and not a ‘personality disorder’ . The week was full of very different activities from the thrill of the giant swing to the more relaxing paper folding. 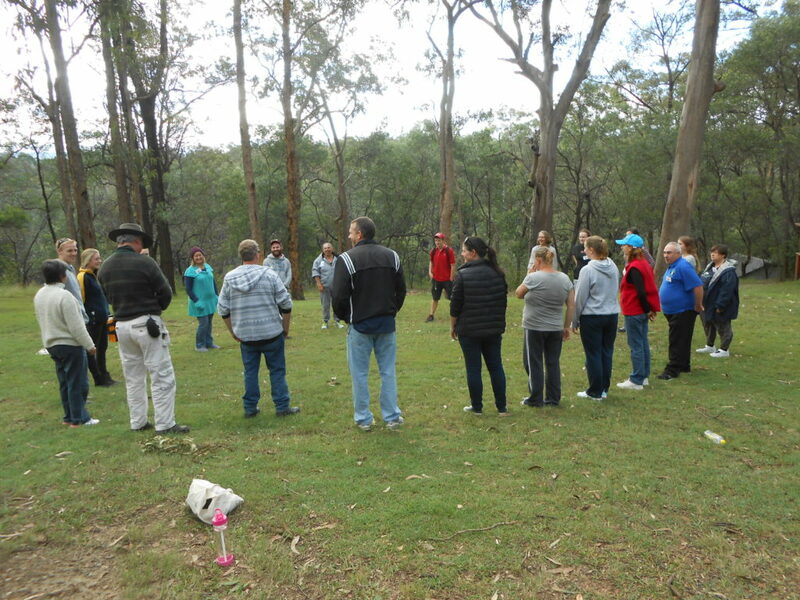 All in a beautiful bush setting and made especially enjoyable by the skills of the YMCA staff group leader. His imaginative scenarios at one point actually had the red group working together really hard to retrieve buried treasure from its secret place to the designated beach through shark infested waters. Some of us may not have made it through without the support of our trusted team. But I must say the most enjoyable activity for me was the whole group getting together for a bush dance evening. By then some of us had started to really bond and it was great fun in a very safe environment. The whole week was a very positive experience and Recovery Camp has been a real milestone in my life. I am a much more confident person as a result. I so much appreciate the thought and hard work that has gone into providing such an innovative experience. I met some really beautiful people and if the future of mental health treatment is in the hands of the compassionate staff and students I met during the week then the opportunity for recovery from mental illness is in very capable hands.